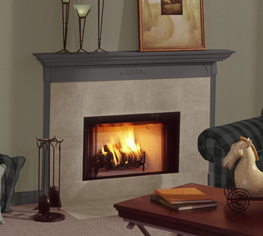 The Hearth & Home Technologies Builder's Choice provides substantial width and hearth depth, giving greater visual hearth area than competitive models in the same category. A first-class spacesaver, the BCBV36 will also fit tight into corners and requires only a minimum chase depth. Available as a radiant model, the BCBV36 offers the best look and quality in its class.